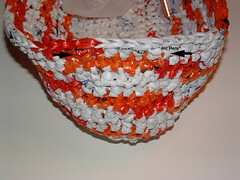 I present my latest creation — Variegated plastic bag yarn or plarn as it so commonly is known as in the crafting world. Pink, orange, and white plastic bags were used to crochet this variegated recycled bag. The pink and orange bags are plastic bags that newspapers are delivered in and the white is from just regular retail bags. I used these 3 colors to create my variegated look by assembling 3 loops of pink plarn, 2 white loops, 3 orange loops, and 2 white loops, then repeat this order for the variegated look. 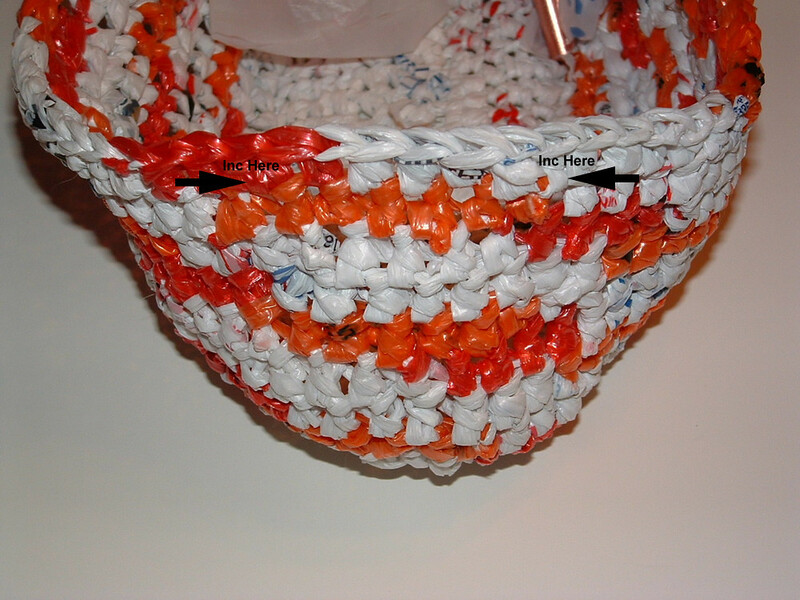 Here is my plarn making tutorials for creating yarn from newspaper or retail plastic bags should you need to see how to make plastic yarn. 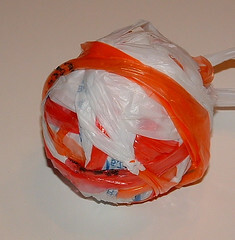 This plarn ball was made using newspaper and retail bags together to create the variegated colored yarn. As I outlined below, if color pooling becomes a problem just add another white strip of plarn to offset the pooling. I found if I added an additional white strip to the 2 white ones, it solved the pooling issues with the tote bag as I crocheted it. Enjoy the free crochet pattern below and happy crafting to all! This variegated plarn is created by assembling 3 loops of pink plarn, 2 white loops, 3 orange loops, and then 2 white loops, repeat pattern for variegated look. with measurements flat 17″ across, 12″ high, and 11″ long base. 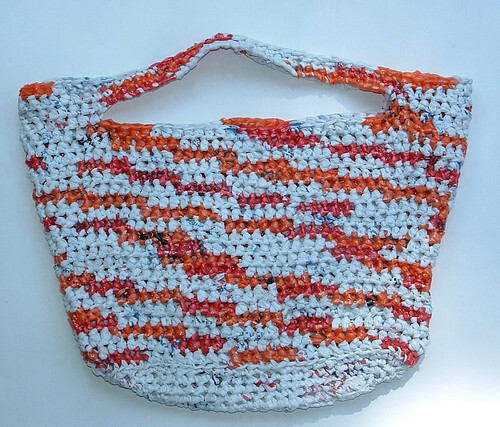 The bottom of bag is crocheted with just plain white bags. Using just white plarn, Ch 20. Sc in 2nd ch from hook and in ea chain st down to end. Continue around other side of chain by working a Sc in ea st to other end. Work 2 Sc in ea of the two end sts, then Sc in ea st to other end. Work 2 Sc in ea of the two end sts and then Sc in ea remaining st of round. Do not connect at end of rounds unless told to do so. Work 2 Sc in ea of the four end sts around curve at end, then Sc in ea st to other end. Work 2 Sc in ea of the four end sts at the end’s curve and then Sc in ea remaining st of round. You will end the all white plarn here but leave st on hook to start next round using the variegated plarn. Using variegated plarn, pick up st from last round. Working in BLO, Hdc in ea st of round. Working in both loops now and for the rest of pattern, Hdc in ea st of round. Don’t join but just continue working with variegated plarn for balance of pattern. If pooling of coloring begins to be a problem, just add an extra white plarn strip along with the 2 white strips as needed to stagger the colors. I had to add a white on this round to stagger my colors but then I was okay for quite a few rounds. But did have to add a white here and there to provide a good stagger of my colors as I worked the tote bag. Tip: You want to work increases at curves on either side of the end so it is even. Your 5 Hdc sts should be at center of the end of bag with the increases on each side at the curve. Picture a horseshoe shape with increases at beginning and end. Click on photo above to supersize it as I have the increase stitches marked. Work even with Hdc in ea st.
Repeat rnd 15 (inc rnd) for all odd numbered rnds and repeat rnd 16 (working even) on all even numbered rnds. Work Hdc in each st of rnd. Hdc in ea st at front (approx. 7 sts or 3 inches from side.) Ch 27 for handle and skip ( approx 28 sts at center front and join with Sc into the 7th st from side. Work Hdc in the 6 remaining sts. (Make sure each side of handle matches each other. I say approximately as the number of total sts you may have could be a bit different than what I have. You just want to make sure each number of sts are the same on either side of handle. Then Hdc around to other side and repeat the same steps as above. Check to make sure the openings match where handles are so they are centered over each other. Hdc in ea remaining st of round ending at side of bag. Hdc in ea st to handle, work Sc evenly around chain of handle. (Approx. 27-28 sts). Then work Hdc in ea st around to other side’s handle. Work Sc evenly around handle and Hdc in the remaining sts of rnd. Hdc in ea st of bag and Sc in ea st of the handle on each side. On final rnd, end at side of bag with a Sc and Sl St into the last several sts to end with a smooth edge at side. I love how the colors pooled in this project. I realize you had complete control over that, but I still love it! And I’m so envious you get bags other than white and brown!!! Hi! I love your bag! I’m part of a Ravelry group that is on a mission to connect every pattern with a picture. Your pictures here are great! Could you upload these pictures to a project page on Ravelry and then feature the photo in the pattern? The patterns without photos are at the end of the line and most never even get considered. More people would see your pattern if it had a picture. Let me know if I can help. I will send you a message if you’re on Ravelry. Thanks! Thanks for the heads up about the photos and I have granted use of the photos to Ravelry. I appreciate the information and am glad photos of the projects can be added. Look store bought. Great little project.